It's a belief. It is an approach to care. It represents a tremendous amount of research that identifies the process changes we can make to improve nutrition within our healthcare institutions. The following information, from the More-2-Eat study, provides you with the knowledge and tools needed to take the very real and practical steps that lead to big nutritional change for your patients. "I think this More-2-Eat is just a start, and after the study is over we need to continue and that is something that speaks to me loud and clear, that this isn't just something that stops after the study is over. We've got to keep going and figuring out how we can continue making it important, and that nutriton is important and that food is medicine." This innovative implementation study occurred between May 2015 and March 2017 and was funded by the Canadian Frailty Network, which is supported by the Government of Canada through the Networks of Centres of Excellence (NCE) program. Five Canadian hospitals in four provinces evaluated their own nutrition care practices, identified gaps when compared to the INPAC and worked with the unit and hospital teams to improve practices. During the one-year of implementation (2016), many successes and changes in practice were realized. INPAC was found to be a feasible algorithm for improving nutrition care of medical patients. Key learning from the five sites is included in this toolkit. For more information about the study, including summaries of findings and links to published papers, see the More-2-Eat page. The Integrated Nutrition Pathway for Acute Care (INPAC) is an evidence and consensus based algorithm that supports the prevention, detection and treatment of malnutrition in hospitals. INPAC is considered a minimum standard to meeting the nutritional needs of patients. In the 'What' section below, each INPAC activity is described. Tools specific to each activity are provided under the Tools tab. INPAC works best when you build on existing strengths and focus on the activities that meet the needs of your patients. "I think More-2-Eat has improved teamwork. I think because we're all in it together, it's not just the nurse that needs to do it, it's not the healthcare aide, it's anybody coming and going in that room. Anybody can help, it's not just one person's task." Key activities to reach these goals are: malnutrition screening; assessment to diagnose malnutrition; standard care to ensure all patients can access their food and have sufficient food they can eat; monitoring to ensure patients are improving; advanced care strategies to promote food intake with focused treatments; and specialized care, provided by a nutrition professional. Explore each INPAC activity in more detail. Screening is the first step of INPAC and ensures that detection of all malnourished (medical and surgical) patients occurs within 24 hours of admission. We recommend the Canadian Nutrition Screening Tool (CNST) because it is short (only 2 questions), easy to use, valid, reliable, and does not need to be completed by a nutrition professional. ‘Yes’ to both questions indicates that the patient is at nutritional risk and requires further assessment to diagnose malnutrition. Other screening tools are also available for acute care. Patients identified to be at nutrition risk require a diagnosis to confirm malnutrition. The subjective global assessment (SGA) is the gold standard for diagnosing malnutrition and is also recommended by The Canadian Malnutrition Task Force (CMTF) for triaging nutrition care. SGA is a simple, standardized, bedside method of assessing the risk of malnutrition and identifying those who would benefit from nutrition care. It provides an accurate diagnosis in 10 minutes. 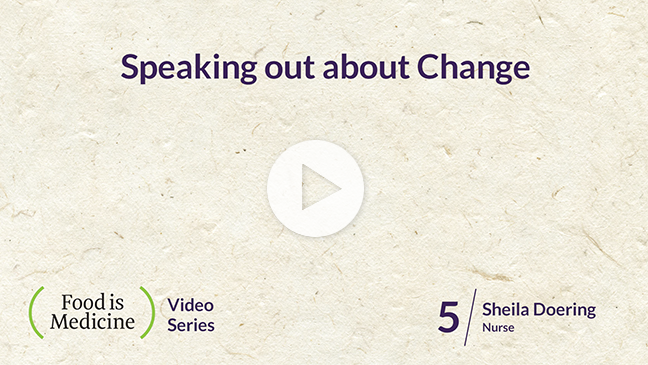 "There's so much more awareness and I guess involvement of the nurses [in nutrition]. So it's not just this tray is arriving for this person. Yes, it's the correct diet. Excellent, they're eating. Do they need help? It's a little bit more involved than that now. So they can look at a patient and identify a patient that's at risk and maybe even start to feel more comfortable taking actions before the dietitian comes in to see that patient. So I think very impactful." Standard care refers to the minimum level of care that should be received by all patients, regardless of their nutritional status. Standard Nutrition Care strategies, such as addressing the patient's positioning for eating, vision or dentition needs, concerns about pain or nausea and making it easy to eat provided food (e.g., open packages) can promote food intake for all patients. Poor food intake predicts length of stay and affects the patient's overall hospital experience, and so food intake monitoring is another standard practice. Malnutrition can develop quickly in hospital, so it is important that food intake monitoring occurs for all patients. Poor food intake, even in a well-nourished patient, can extend the hospital stay. The My Meal Intake Tool (MMIT) has been developed and tested with older patients, and can be completed by those with adequate cognition, family or a staff member. A variety of food monitoring tools can be used. The key is ensuring that when poor food intake is identified, actions are taken to improve intake. "If the patient's eating poorly then you need to do something about it. It's not just writing it down and not doing anything about it. … this way there is a next step to follow, so that should be affecting the patients." "Honestly, at first, of course, we were kind of overwhelmed [to do weekly weights]. But now I think it's getting better." Weight monitoring involves taking patient weights and tracking them regularly throughout the duration of their stay in hospital. This vital statistic is necessary for physicians, dietitians, pharmacists, social workers, occupational therapists, physiotherapists, and more, to make appropriate decisions about various treatments or equipment. Weekly weights should be a routine for all hospital patients. Dedicating specific days (e.g., Weigh Wednesdays) to collect patient weights can help to ensure this information is tracked. Advanced care involves strategies to improve intake beyond the standard care provided to all patients. Advanced care is needed to address malnutrition (i.e. patients identified as SGA B or C). The objective of this care is to provide more nutrient dense food to patients at meals and between meals to optimize oral intake, while still providing all components of standard care. A variety of activities can be undertaken to improve intake. For example, higher energy and protein food offerings can be provided at and between meals, or small amounts of oral nutritional supplements (e.g. 60 mL) can be provided at each medication round to ensure that more calories and protein are consumed. "Patients are more compliant with [nutritional supplement] shots than giving them the whole bottle." "The SGA Cs are the ones we're paying more attention to and might be taking more of my time, but I wouldn't have been able to weed all those out. I would have been doing the exact same thing, a full assessment on every single patient, which is time, time lost that I could have been seeing the patient who really needed to see me in a timely manner." Specialized care refers to the care a patient receives if they are diagnosed as severely malnourished (SGA C). A comprehensive dietitian assessment is the basis for INPAC Level C: Specialized Nutrition Care. This assessment should occur within 24 hours of completion of the SGA. Treatment is typically specialized and requires an individualized nutritional care plan. Enteral or parenteral nutrition or other treatments that are not provided as part of Advanced Nutrition Care, are often required to meet the nutrition needs of these patients. Some mild/moderately malnourished patients (i.e., SGA B) may also benefit from a comprehensive assessment and being treated and followed by a dietitian. Each unit/hospital can tailor Specialized Care to meet the needs of these patients. Patients who are identified to be malnourished (SGA B or C) and who do not fully recover their nutritional status during their admission, require ongoing care in the community. Health care teams should strive to provide a referral for ongoing nutritional treatment by a dietitian when rehabilitation of nutritional status is on-going. Health care teams need to educate the patient and family on key community resources that can support access to food (e.g. meal programs) and aspects of their nutrition care plan to support continued recovery in the community. "We need to show that we're actually making change, and helping patients, and keeping them out of hospital, and putting safety nets in place in the community. That's our job. I don't think that up to this point that I really realized that we could do all those things." Now that you have reviewed what needs to happen to improve nutrition care, the next question is how. More-2-Eat helped to identify what ingredients are necessary for success when improving nutrition care. The following sections outline stages of making change, however it is important to remember that change is more of a cyclical process. With each newly implemented practice, stages will need to be revisited as required. 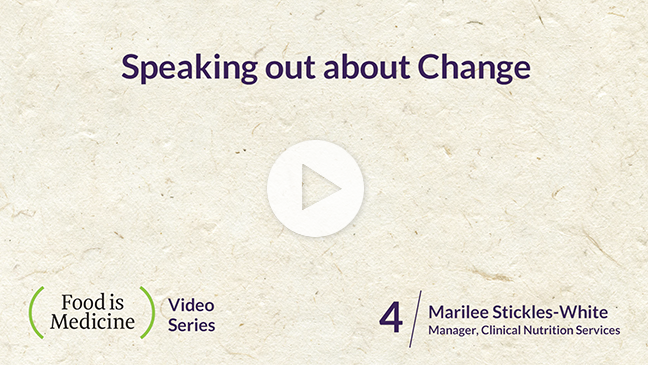 Resources to support making change in your hospital can be found under this tab. "What I'm hoping is that people will identify some simple small changes that will have a maximum impact for the patient." 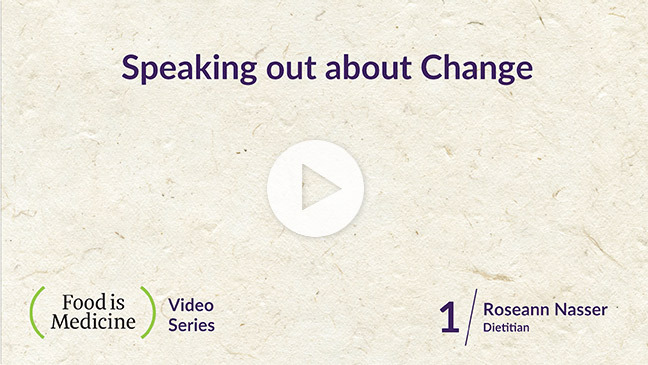 Everyone has a role to play in improving nutrition care. A champion can drive the change, but needs a supportive team to make it happen. 'Context rules' so what works in one unit, may not work exactly the same in another. Education alone is not enough to improve care practices – you need to do more. Collecting data and sharing the results with the team are essential ingredients to stimulating and supporting the change process. Are you ready? Rather than rolling out all of INPAC at once, start with one activity on one unit. The unit staff, hospital management and a few key people need to be ready before you start making changes. Staff and management need to understand that improvement is needed, and be ready to slowly start making progress that can be measured. If the unit is not ready, change will be more difficult. Readiness checklists may be useful in supporting this decision. Before embarking on improving nutrition care activities, go in with the mindset that this is a long-term process. Sustained change takes time and dedication. "Work with the staff and they become part of the solution to the change. It's easier to get it embedded in their daily work because they helped define what that daily work really looks like." As with any change, you need to get the right people involved. Everyone has a role to play in nutrition care, but not everyone needs to be involved all the time. You'll need initial buy-in from management through to buy-in from front line staff and anyone who will be affected by the changes. Start with the believers. Provide education about the problem. Seek feedback on potential solutions. This will help your team feel engaged in the process, which may facilitate their buy-in. 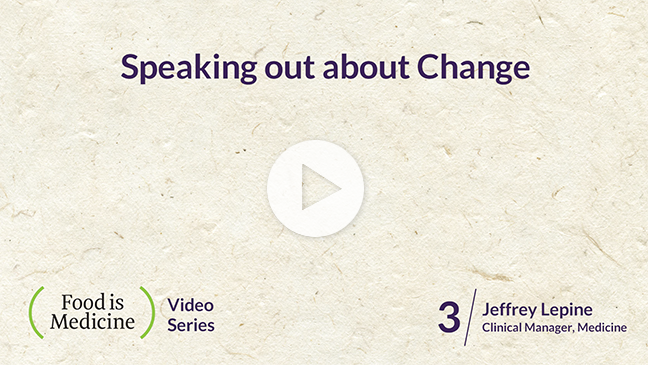 Remind staff why the change is important to patient outcomes. "It's almost like saying every patient needs to walk but that doesn't mean that physio needs to walk with every patient. Right. Every patient needs proper nutrition care but that doesn't mean it should necessarily be a dietitian." Changes need to be embedded into the routine. Start small. Make the process as easy as possible. Create realistic goals that include a timeline and target so you can build momentum and keep the plan moving forward (e.g. By September 1, 80% of all admitted patients will be screened within 12 hours of admission by nursing staff). More-2-Eat sites collected data (i.e. INPAC audits) and reported results to relevant team members to stimulate continued improvements to meet goals. Reward successes and provide continued support to those who need it. Slowly, the changes will become part of the routine. "I think it's like anything. It's got to be like hands on. It's got to be – it's got to be people that are visible on the floor to see what goes on; not just me reporting it or the charge reporting it they've got to see it." Congratulations! You have reached excellence and made a new/improved nutrition care activity part of the routine. But, it doesn't stop here. Once changes are embedded into routine, occasional audits, reminders, etc. are needed to make sure that the change stays part of the routine. Try not to lose momentum. There may be a drop in performance of the new practice, but this is to be expected. Use this data as a reason to re-engage staff on the activity and keep it in the forefront of their routine. Champions need to be tenacious with making and sustaining nutrition care improvements. "Well, we have to keep auditing. Audits are a huge thing. If you keep auditing and you see that it's fallen to the wayside then you can talk about it more. And keep trying to sustain everything that we've started."